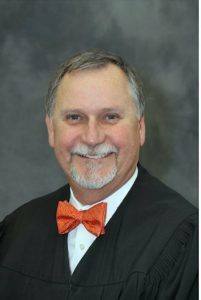 Judge Allan Hardcastle will talk about the juvenile delinquency both here and statewide. Much of his talk will focus on the increase of the seriousness of the crimes charged, the increase in violent crime by minors in criminal street gang cases, and the huge rise in mental health issues. He will also speak for mentorship and the CASA organization. (Court Appointed Special Advocates). Fancying himself as the Wizard of Oz, President Doug Johnson opened the meeting and advised us not to look behind the curtain. Our regular meeting room was divided in two by a curtain, so we were squashed into a small space with a larger-than-usual crowd. The Pledge of Allegiance was solemnly led by Past President Mark Burchill. Doug Chase doug deep and went deeper with an extensive thought-provoking quote from Ze Frank entitled “Invocation for Beginnings.” It was about the interpretation of life – and, just two spits shy of a program presentation. Ryan Thomas led us in welcoming these visiting Rotarians: From the West Santa Rosa Club – Sue Bell; from Santa Rosa Sunrise – Vicki Lockner; from Headsburg – Rick Tang; from Rohnert Park-Cotati – Peggy Wyman and Michele McEntee; from Petaluma Valley – Terry Bryant; from Gualala (lala land is in SoCal, right?) – Jeff Watts; from Calistoga – PDG Kevin Eisenberg; from Windsor – Ed Turner; from Middletown – Ben Moulton; from Sonoma Valley – Bob Kwellen; from Valley of the Moon – Peter Copen; and finally, Ron and Francine Selim from the South Ukiah Club. Holy ravioli, Batman! That’s a lot of visitors. Matt Everson (former member) was introduced by Diane Moresi; Richard Lazovick introduced Paul and Ilse Lazovick; Kathy Schwartz was a guest of Past President Will Haymaker; Louise Turner was the guest of visiting Rotarian Ed Turner; Past President Kathleen Archer hosted Loralee Carter; Elizabeth Karbousky introduced her father-in-law, Alan Karbousky; Matt Fannin hosted Doug Lyons; Dan Whipple, the new CO of The Salvation Army (Santa Rosa), was introduced by Blaine Goodwin; Steve Schofield was the guest of picker-extraordinaire Layne Bowen; Gerry Humes (the better half) was introduced by her husband, Cecil Humes, who also introduced Carolyn; and, finally, Chris Smith (of The Press Democrat) was introduced by Kris Anderson. Holy multitudes, Batman! That’s a lot of guests. Eileen Carlisle reports sunny skies all around (as far as she can see). Two thumbs up! Club rosters are available for pick-up at our next Rotary meeting, so says Secretary Jack Abercrombie. (If Club rosters are not your thing, Club roosters are also available. See Past President Steve Olson or Sam McMillan, they are our 4H Ag advisors). Support Your Local Rotary Club Foundation! Past President Jeanne Levin says that our Club Foundation has received a donated picture with a Rotary Peace theme that commemorates Rotary’s efforts towards world peace. The picture will be on display at the next two meetings and it is open for bids as a silent auction item. Proceeds will be added to the John Brown Memorial Veterans Scholarship Fund. An initial bid of $250 has been received. The Treasurer indicates that several members have yet to pay their semi-annual dues for the July to December period. Please take care of this now. We have an I.O.U. for lunch from our meeting at St. Rose. Please settle this debt now. With $86 in the pot, the excitement level was a generous “2” on a 1- 10 scale. Mike Kalhoff administered the raffle (it takes a CEO and a Mark Burchill impersonator to do this you know). Past President Will Haymaker was the ticket winner; but, his lucky streak ended as he walked with just the $10 consolation prize (but, that’s not a bad return on a two buck investment). Although, he could’ve had a bottle of two buck Chuck Chardonnay. Past President Debi Zaft was looking for the correct answer to this months’ question: What does Phoenix Air do? Bob Higgs provided the answer: They airlift US citizens located in foreign countries that have infectious diseases (particularly Ebola in 2014) and bring them home for treatment. 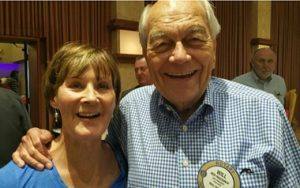 The VP of Operations at Phoenix Air is a Rotarian from the Rotary Club of Bartow County, Georgia. Bingo, Bob’s in the money hunt drawing at the end of this Rotary year!! August 27 – A Rotary SCARC meeting hosted by the Rohnert Park-Cotati Club will be held at Sally Tomatoes Event Center from 5:30 – 8:30 PM. Cost is $45 per person. RSVP to cschollmann@aol.com . Reservation required. August 29 – A special 4H dinner at Richard’s Grove to honor Past President Steve Olson for his commitment to Sonoma County agriculture. The event starts at 3 PM and runs to 8 PM. There’s a new game in town (Rotary town, that is). 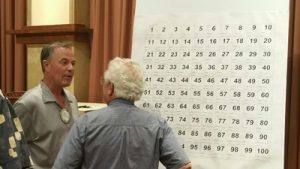 It’s the Instant Paul Harris Board where squares on a grid are sold ($10 each) to raise money for RI Foundation AND you get credit for contributing to your own Paul Harris Fellowship. Squares drawn from the grid will win prizes, including wine, hats, pins, jam, gift certificates, etc. 61 squares have been sold so far and there are 39 to go. Let’s fill up that board at next weeks’ meeting! Be there, so you can be square – a winning square. The game repeats, so plan to plug-in to the grid, win some prizes and give them away as Christmas/holiday gifts. That would be the win-win-win trifecta. Jeff Watts, the visiting Rotarian from the Gualala Club, informed us of the Gualala Arts Festival taking place on October 3 in their fair community. Maybe Lena Humber knows something about this (?). Past President Yale Abrams invites us to join him for a hands-on United Way project on September 9. He will give more details and accept sign-ups. Past President Mark Burchill announced there will be a wine tasting get-together at his house on September 14, with more details to come. Let him know if you plan to attend. Watch out ! President Doug has been sharpening the spear tip on his money rake (more like a javelin really)! Mike Kalhoff, for a trip to Chicago to attend pro baseball games and for the dual-purpose of irritating Giants fans. He gave $25 to the Club. For going to Chicago in the summer, he should have received $25 from the Club. Jack Abercrombie is back in the news for having achieved his and Priscilla’s 58th wedding anniversary. Jack gave $100 to buy 10 squares in the open game of Instant Paul Harris Board. Jack’s secret to a long marriage are two simple words: “Yes, dear“ mixed with the right blend of silence. Wives do not want to hear from the peanut gallery. Our speaker was Aimal, an Afghanistan national, who was also our speaker on June 3 (see that Bulletin) and he returned to complete his presentation on the status of his country now and the potential for its people. Jeff Gospe introduced “Aimal” (he uses only his last name to protect his family back home from the threat of attack by the Taliban.) Aimal then introduced his wife to us. They were married since their visit with us on June 3. 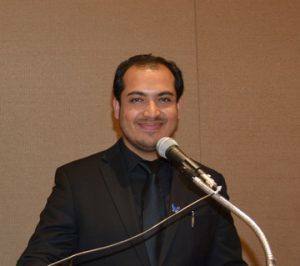 Aimal was a language interpreter for the U.S. Army starting shortly after his high school graduation in 2006. He worked with various units of the US military in Afghanistan from 2007 to 2010, including a 900-member unit of the Nevada National Guard in 2009-2010. In 2010, he became a student in the US at the University of Nevada, Reno where he graduated in 2014 with a degree in Political Science. While he was with the Nevada unit, they implemented a new peaceful strategy to improve relations with local tribal leaders by listening to their concerns, using local people to work on construction projects and forging a better working relationship. They termed this strategy “Go Green.” As this strategy was deployed, they noticed fewer attacks were being carried out by the local factions. As General Stanley McChrystal had said, no amount of bullets will win the Afghanistan war. It will be won when the hearts and minds of the Afghans have been won. Aimal also focused his comments on the improvements being made in Afghanistan. He credited the U.S. for opening schools for girls. He noted there is a high percentage of the 31 million population that are young and who will be best reached through better education. He believes that education is the answer to empowering the people. His country now has private schools and there is the American University of Afghanistan in the capital city, Kabul. Most media outlets do not report on the improvements taking place in Afghanistan and he does not understand why that is so. Today, August 19, is Independence Day (from Great Britain) in Afghanistan. Generally, too many Afghan presidents have been killed. Lately, there has been a more peaceful transition. About 85 percent of Afghan people have communication access and there is a lot of high tech rolling out. Social media sites are used often by the Afghans, particularly by the younger generation. Use of social media is reducing some of the conflicts that stem from having many tribes and dialects throughout the country. Improvements in Afghanistan will continue if the country becomes a more peaceful place. He sees no future for the Taliban, as they are harsh rulers. The last point Aimal made was to say that his country has a high potential for sustaining its growth and development into a more peaceful and prosperous nation. There is now the ‘rule of law’ in place, better security (with an internal security force of 400,000), all the roads are now paved, and 31 percent of the Parliament members are women and life expectancy has increased for both men and women – though there is still room for improvement. With all of the people and natural resources of his country, he sees that it will be a desirable place to live and visit. This was one great 2-part program from Aimal. This writer hopes he did justice to Aimal’s remarks. Thought-for-the-Day: President Doug is only 216 days away from becoming a “double-digit midget.” If you know what that means, you’d better tell him!